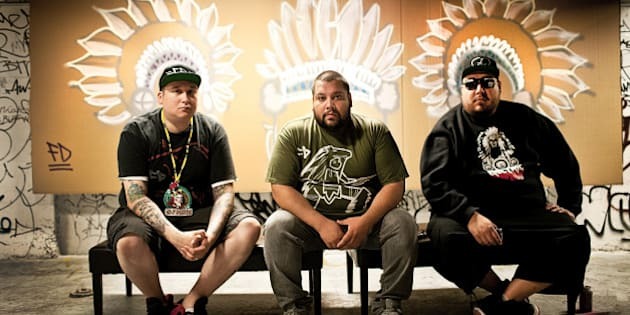 After "Deejay NDN" Campeau, of Polaris Prize nominees A Tribe Called Red, recently filed a complaint with the the Ontario Human Rights Tribunal, the musician and First Nations activist received good news today when the Nepean Redskins Football Club announced it would change its name and its logo at the end of the season. Although Campeau posted earlier this morning he heard Ottawa radio station CHEZ 106 state there might be an announcement coming regarding the team, he confirmed the news via twitter with the Twitter account name changed to #CHANGETHENAME. News of the decision was met with congratulations from many people. Campeau replied to one via Twitter just before noon EST. The Ottawa Sun reports that sources told the publication when this football season ends the parents, players and team officials will set out on deciding a new name for the team. The change comes among growing opposition in the U.S. regarding the National Football League's Washington Redskins and their continued used of the name and logo. According to the team's official site, the club was formed in 1978 and was initially named the Barrhaven Buccaneers. In 1981, the team was renamed the Redskins as the team colors of maroon, gold and white were the same ones worn by the NFL team. No official statement or confirmation was found on the official site nor on the team's Facebook page regarding today's decision. As previously reported, Campeau filed the complaint on behalf of his daughter a few weeks ago. The musician also said he would allow the team five years to change its name and logo as well as help to offset the estimated $100,000 cost associated with changing the name and logo.